As the first adhesive manufacturer to open a specialist training centre in 1992 for standards and fixing techniques, BAL understands that quality workmanship is paramount to an installation. Since it began to offer training courses to help tilers and flooring contractors maximise their skills, more than 100,000 people have received training from BAL with more than 16,000 people trained at a BAL training centre. In fact since the company opened the doors to its new Innovation and Technology Centre (ITC) in Stoke-on-Trent in March 2015, nearly 2,000 people have been trained at the new site. Complete with 40-seat auditorium (with standing viewing platforms), practical training bays, breakout areas and meeting rooms, the new facility leads the way in training and development in tiling and flooring. Dave Rowley, Training Manager at BAL, said: “I believe that training is vital to the continued success of the company and the industry in general. “Maintaining high standards and fixing techniques helps to prevent poor practices and incorrect specifications which can have a negative impact for all in the industry including manufacturers, distributors, specifiers, contractors and fixers. BAL provides a full range of training courses for apprentices, fixers, contractors, and distributors. BAL’s training is endorsed by The Tile Association (TTA) andthe Construction Industry Training Board (CITB) while the company has also been highly commended by the National Training Association (NTA). 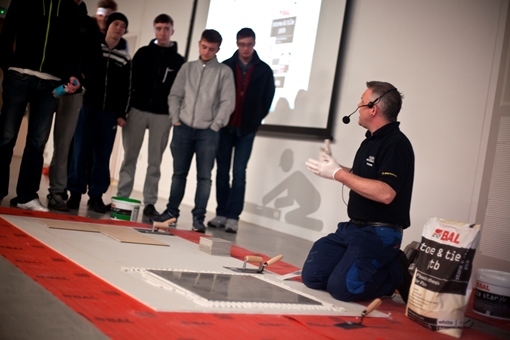 · Introduction to screeds and subfloor preparation – a practical course on preparing, laying and rendering floor screeds. · Preparing and tiling timber floors – demonstrations and practical training on preparation/levelling, fixing and grouting to single layer timber, plywood and floating timber floors. · Preparing and tiling to anhydrite screeds – practical and theoretical training on preparing and tiling to anhydrite or calcium sulfate screeds, including the use of uncoupling systems. · Preparing and tiling to under tile heating – practical and theoretical demonstrations on preparing and tiling to undertile or under floor heating systems. · Tiling and grouting for hygiene or chemical environments – including the use of epoxy adhesives and grouts. · Preparing and tiling wetrooms – in-depth course on waterproofing/tanking wet rooms, fixing, grouting and essential products. · Introduction to adhesives and grouts – foundation level course on cementitious and ready-mixed adhesives and grouts, basic fixing techniques for inexperienced tilers/apprentices. · Five day wall and floor tiling course – introduction to preparation, setting-out, fixing and cutting of wall and floor tiles and including grout and finishings. BAL also provides bespoke courses to suit individual training needs, for example, the company recently held a special one-day course for mosaic mural artists, and thanks to the flexibility of the ITC, more bespoke courses like this can be held at the centre. A new course on the company External Tiling Solutions for balconies, ground-floor terraces and roof terraces has also been launched and is available to book through BAL Product Support Technicians (PSTs). Launched this year, BAL’s External Tiling Solutions uses proven technology from sister company Gutjahr, which protects outdoor covering against the unpredictable British weather and diverse extremities such as rain, frost and heat. Gutjahr System Technology from BAL offers designers and contractors innovative drainage, ventilating and uncoupling solutions for cantilevered balconies, roof terraces and ground terraces. The one-day training course for tilers and contractors provides an overview of the system, practical demonstrations and theoretical presentations. Those completing courses at BAL receive a certificate of completion, plus merchandise and product worth more that the course. To find out more about BAL’s range of training courses and to book yourself a place visit www.bal-adhesives.com/training or call 01782 591100.